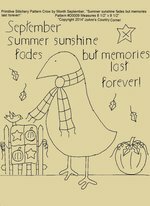 #B136 Primitive Stitchery Pattern Crow by Month September "Summer sunshine fades but memories last forever!" 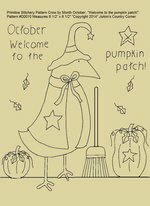 #B137 Primitive Stitchery Pattern Crow by Month October "Welcome to the pumpkin patch!" 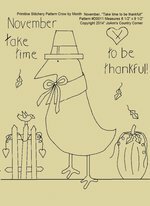 Measures 8 1/2" x 9 1/2"
#B138 Primitive Stitchery Pattern Crow by Month November "Take time to be thankful!" 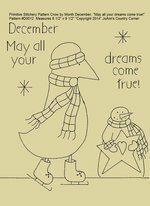 #B139 Primitive Stitchery Pattern Crow by Month December "May all your dreams come true!"